The newest addition to the Tillinghast Pond Management Area is the Bates Loop Trail. The trail opened late in 2015 and loops around the southern end of the property. Starting from the Hell’s Gate trail-head, the red blazes lead you through a short section of woods before crossing Plain Meeting House Road. From here you pass a cellar hole then turn behind the remains of what appears to be a barn. This is the Bates Family Homestead. The trail then splits. Here we continued straight following the red blazed trail as it gently climbed up and over small hills. The area is strewn will stone walls and boulders, oddly shaped at that, as we passed through groves of white pine with an occasional pitch pine. Near the eastern end of the property we came across a pile of stones before coming to Phillips Brook. To the right is the double red blazed crossover trail that follows the brook. We would explore that later. For now, we crossed the bridge and continued to follow the single red blazes through a beech grove and then onto an old road. Along the road there is signage indicating that you are along the University of Rhode Islands property. After a short trek along the road the red blazes turn to the right back into the woods, downhill a bit, following a stone wall for a short section, before coming to a dam. There is a small pond to the left and Phillips Brook is to the right. Just after the footbridge, we turned right to explore the quarter mile crossover trail. This short stretch is another of Rhode Islands beauties. There are a series of small waterfalls and cascades along the trail. After following the crossover trail to its end we retraced our steps back to the dam, then continued straight following the single blazed trail once again. The trail led us through another pine grove with towering trees before returning us back to the Bates Homestead. From here we retraced our steps back to the parking area. Trail map can be found at: Bates Loop Trail. 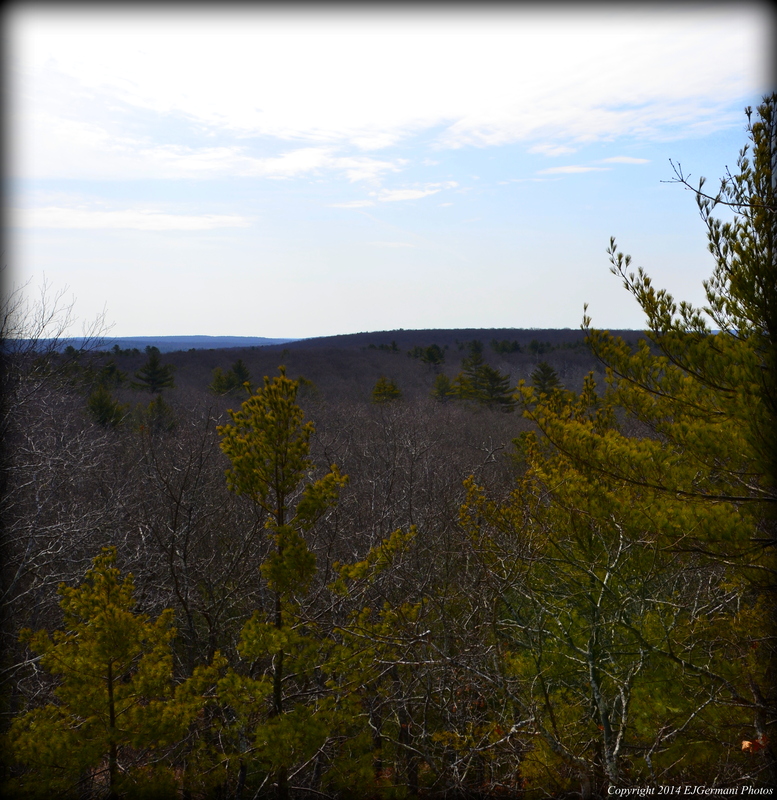 I started this hike from Hazard Road entering the management area along the double orange blazed Shepard Trail, one of the newest established trails in Rhode Island. The Shepard Trail crosses over the McAlpine-Shepard Preserve section of the vast Tillinghast Pond Management Area. Tillinghast, with Wickaboxet, offers nearly 10 miles of trails. This hike would be one of three loops that I would cover in the management area. The Shepard Trail itself is a little less than a mile and travels through thick fern covered forest. There are a couple boardwalks to cross as well as a bridge that crosses Coney Brook. There are also a few stone walls along the trail. At the end of the trail is the single orange blazed Coney Brook Trail. Here I opted to go left and follow the trail clockwise as it first led me up along Hemlock Ridge. After passing through an area with quite a variety of mushrooms the trail abruptly turns left, down a set of stairs, to the Coney Cascades. This water feature creates a small gorge along the trail that the brook trickles through. At the top of the hill is a small pond and dam. Soon I came to the next intersection. The orange blazed trail continue to the left as it follows the edge of a large open field, but first I followed the green blazed Loggers Trail for about an 1/8 of a mile to take in the views. At the top of the hill you can see several miles to the south and the large shrub covered field is very picturesque. After a short time lingering I returned to the orange trail and continued to follow it along the edge of the field until it came out to Plain Road. Here are where you will get your first glimpse of Tillinghast Pond. Turning right I followed Plain Road a couple hundred feet looking for the orange (and white) trail blazes that turn to the left. The trail then heads into the woods toward the pond. A trail appears to the right (only blazed white at the intersection), you want to turn right here, but first continue straight to the end of the peninsula for a sweeping view of the pond. Continuing along the orange and white blazed trail you can catch glimpses of the pond to the left. Soon the orange trail turns right, crosses Plain Road once again, and enters an area with active logging. The logging is being done to maintain the wildlife habitats on the property. When going through this area ignore the logging roads and keep straight as the trail will appear ahead. The aptly named green blazed Loggers Trail appears on the right once again, but continue straight. Soon you will re-enter the woods once again and pass an area of several stone walls. This is the Parker Homestead. Continuing along the orange blazed trail I would soon come to the spur trail I came in on. From here I retraced my steps back to the trailhead. Trail map can be found at: Coney Brook Trail. For this hike, I decided to start at the Hell’s Gate Trailhead instead of the main parking area on Plain Road. There is a small parking area here and the trail, an old cart path, leads to the back side of the Flintlock Trail. Along the way I passed an area of tall pines, a small pond and Phillips Brook. I also caught a glimpse of a deer of in the distance. Reaching the yellow blazed Flintlock Loop Trail, I turned right passing through a small field before entering back into the woods. Soon a blue blazed trail from the right joins the yellow trail. The blue blazed trail is the Wickaboxet Loop Trail. Next an unmarked spur trail to the right leads to a scenic view of Phillips Pond. As the yellow blazed trail winds through the thick woods, the blue blazed trail then turns away to the right. Here the yellow trail turns left. The trail ahead, currently blocked, leads off of the property. Soon I reached another fork in the trail with signs indicating the North Spur and the South Spur. I opted the south and explored an area known as the Boulder Garden. This area is quite pleasant, offering a few large boulders along the trail as it winds through a shrub covered forest floor. The two trails rejoin a little later before coming to the intersection with the white blazed Pond Loop Trail. At this intersection the Flintlock Trail turns left. I opted to turn right to follow the Pond Loop. Soon I was catching my first glimpse of Tillinghast Pond through the trees. As the trails winds along the north shore of the pond, I walked though areas of woods, large grass fields, boardwalks, and stopped at several of the scenic viewing areas including Howard’s Rest in particular. Soon the trail comes out to Plain Road where I turned left and followed the white blazes a short distance along the paved road. The orange blazed Coney Brook Trail now joins the Pond Loop Trail for a bit as it jots back into the woods and follows the western edge of the pond. Along this stretch there is a peninsula with a sweeping view of the pond. It is worth the stop. Next the orange blazed trail turns to the right as the white blazes continue straight to the main parking lot. After passing through the parking lot the Pond Loop trail continues along the southern edge of the pond and the Flintlock Trail rejoins. Along this stretch are some rather impressive stone walls. Continuing straight back onto the yellow blazed trail, I soon came to the Ellis Homestead, which includes a cemetery. Soon I came back to the unmarked Hell’s Gate Trail and retraced my steps back to the parking area. 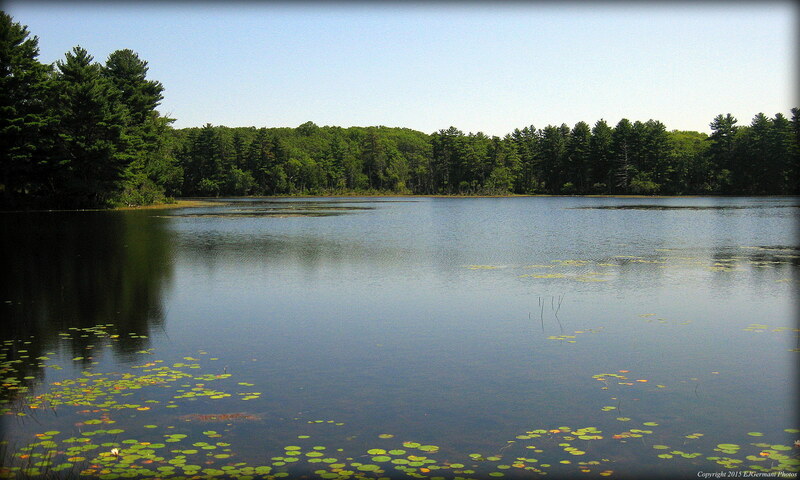 Tillinghast Pond offers three loop trails and together with the abutting Wickaboxet Management Area, one could easily get upwards of 10 miles of hiking here. This area is open to hunting. You should wear orange here during hunting season. 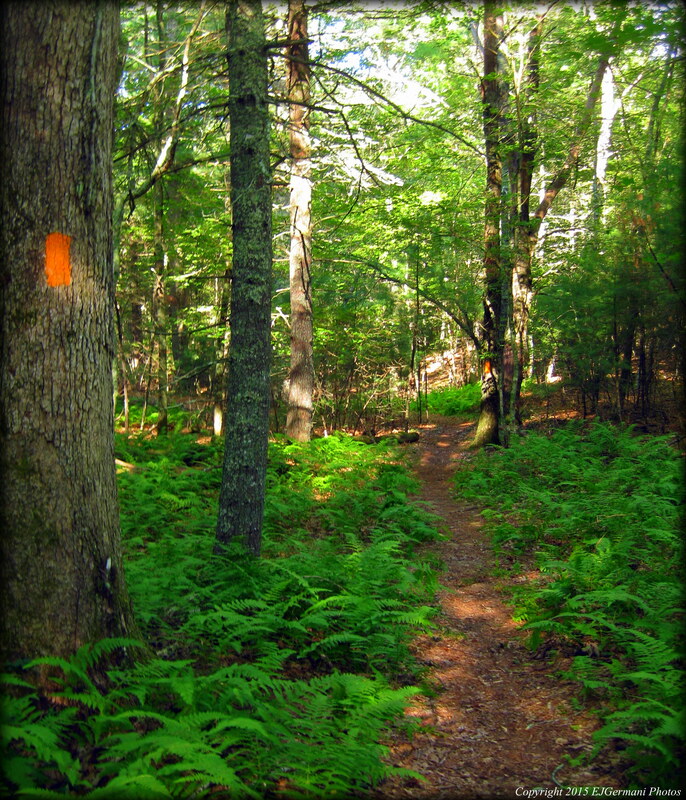 Trail map can be found at: Tillinghast Pond. Moderate to difficult, significant elevation, climbing optional. It has been over two years since I have made my way into Wickaboxet. In the spring of 2014 I came here following the route described in Ken Webers “Weekend Walks in Rhode Island” book. That hike was a two and a half mile walk along old dirt roads that featured quite of few ledges and a former fire tower site. Since then some over the trails here have been blazed including the Wickaboxet Loop Trail. The loop trail, blazed blue, connects to the nearby Tillinghast Pond property and the Pratt Conservation Area and still follows some of the roads that Ken Weber used. For todays hike, a hilly six mile trek, I used the route that Auntie Beak followed (see map link below). Her route covers the Pratt Conservation Area as well as the loop trail with a visit to Rattlesnake Ledge. Wickaboxet is a quiet little gem full of pines and oaks. Although we did not see any wildlife we could hear the many song birds. We started this hike from a cul de sac at the end of Saddle Brook Road. The white blazed trail that runs through Pratt climbs up and over a rather large hill before leading into a valley crossing Acid Factory Brook. The trail narrows in spots and there are a couple of log bridges to cross the streams. The white blazed trail ends at the blue blazed loop trail. Turning right to follow the blue blazes, we passed through a pine grove and we soon came an old cemetery on the right. The graves here date back to the 1820’s. Next we were passing through an area of wild blueberries before coming to an old dirt road. We turned left, continuing to follow the blue blazes. You will notice a unique feature here. Ant mounds. Several of them, and if you look closely enough you will see just how many industrious insects there are here. A little further down the road the blue blazed trail turns to the right. Be aware of the markings or you may miss it. The trail soon passes a cellar hole as it heads westward into the Tillinghast Pond Management Area. The blue blazed trail then turns left following the yellow blazed Flintlock Trail for a bit. There is a spur trail to the left that leads you to Phillips Pond if you feel like exploring. The yellow blazed Flintlock Trail continues straight, but you want to turn left to continue following the blue blazed Wickaboxet Loop Trail. After climbing slightly uphill for a little while, we came upon the Wilcox Homestead. Here is another cemetery that dates back to the 1820’s and another cellar hole. The trail then comes out to a dirt road again. Turning right we followed the dirt road to an intersection. There is another cellarhole just to the left at the intersection. If you were to continue straight you would come out to the main parking lot for Wickaboxet. We instead took the hard left onto the other dirt road. The road would start to gradually climb uphill. There is a wooden post on the left with a trail that leads to the towering Rattlesnake Ledges. There is a narrow path to the left that wraps around the back side of the ledges and up to the top. The view from atop Rattlesnake Ledge is quite impressive. The drop is also quite impressive, be sure not to get to close to the edge. After retracing our steps back to the dirt road we turned left and continued to follow the dirt road until the blue blazes turned right back into the woods. We followed the blue blazed trail passing yet another homestead. The Matteson Farm area has a few cellar holes. One is obviously the house with a set of stone stairs. The other appears to be the foundation of a barn. Soon we came to the white blazed trail again. From here we turned right and retraced our steps to the car. This very hilly section proved to be quite challenging to the end of a moderately long hike. This area is open to hunting. Be sure to wear orange during hunting season. Trail map can be found at: Wickaboxet.